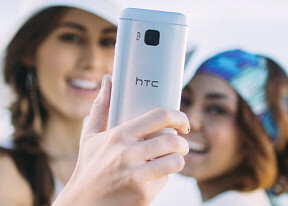 HTC One M9 runs on Qualcomm's latest Snapdragon 810 chip, which utilizes an octa-core processor with four Courtex-A57 cores ticking at 2.0GHz and four Cortex-A53 clocked at 1.5GHz. The GPU in charge of graphics is the Adreno 430 and there is 3GB of DDR4 RAM to ease multi-tasking. HTC One M9 isn't the first device to come with the now controversial Snapdragon 810 platform. The latest Snapdragon chipset is frequently accused of heating up excessively under load causing performance throttling. Unfortunately, the HTC One M9 had every Snapdragon 810 issue you may have spotted online - its all-metal body quickly became unusually hot when running a game or a benchmark, or even when browsing for a while. There was a performance drop when the One M9 got hot, as we confirmed by running extra benchmarks. HTC's response to the overheating allegations has so far pointed out that the software on these pre-production units is not final. The phone received a big OTA update last week while we were in the process of preparing our review. Could it be the final firmware to fix all heating issue, we wondered. We went ahead and redid the whole benchmark session. What you would read on this page is based on the scores we got after the update. We did notice a difference in regards to how hot the phone got under use. It took a longer time for the the One M9 to get hot, but ultimately, it still did get as hot as before. Another change that we did notice after the update is the measurable performance of the smartphone. Before the update it got 4020 points on GeekBench (down to 3761 after the update) and 57900 on AnTuTu (down to 51727 after the update). The single and multi-core CPU scores as calculated by BaseMark OS II 2.0 were slightly higher before the update, too. On the other hand, the GPU benchmarks showed no change at all so we suspect HTC has changed the main CPU throttling policy in relation to the internal device temperature. As we suspected all along, the initial heating woes that the HTC One M9 experienced were only fixable through applying a more aggressive throttling policy which comes with a performance penalty. This seems to be the case after this major OTA update. Of course, perhaps more updates will follow before the phone reaches the market. Ok, so here are the actual benchmark scores. As usual, we kick off our benchmark spree with GeekBench 3 test. It gauges the CPU multi-core performance and the HTC One M9 did splendid, overpowered only by the new (and more powerful) Galaxy S6. The One M9 turned out slightly better than its G Flex2 sibling, which had some CPU throttling failsafe. Next we ran the 64-bit version of AnTuTu 5, a compound benchmark that takes in consideration CPU, GPU, and memory performance as well. 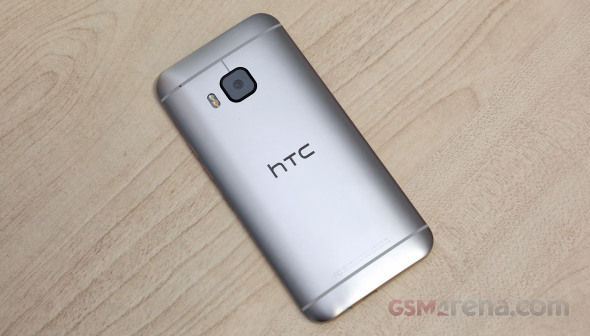 The HTC One M9 score once again is bested only by the Galaxy S6. It still has a significant advantage over the rest of the flagships. The BaseMark OS II 2.0 is quite a popular benchmark, which in addition to CPU, GPU and RAM, also tests web performance and internal storage speed. The One M9 did well, but not as good as the G Flex2 and Galaxy S6. Still - it's better than the Snapdragon 805-running Galaxy Note 4 and Nexus 6. Unfortunately, the single-core and multi-core breakdowns of the BaseMark OS II 2.0 test came out quite uninspiring, where the One M9 scores orbit the bottom. We've decided on including separate storage tests on the internal memory and on the microSD card. We'll be using a very capable Transcend Premium 300x microSDHC UHS-1 Class 10 16GB. It may not be the fastest microSD card out there, but it's fast enough. Our test showed that the HTC One M9 storage is quite fast, very close to Galaxy Note 4 performance on sequential read and write speeds. Make note that the Galaxy S6 uses a new breed of internal storage dubbed UFC 2.0 and it is the undisputed champ in these tests. When it comes to random reads, the One M9 is as good as the G3 and it surely impresses on the random write operations. As you can see, the microSD read and write performance fails to impress. HTC One M9 uses the most powerful Adreno GPU to date - the Adreno 430 - and it has an added performance edge over QHD resolution devices such as the Galaxy S6 because of its lower 1080p display resolution. We ran the GFX benchmark and found out that the Adreno 430 performs on par with the Galaxy S6's Mali-T760 and G Flex2's similar GPU when it comes to raw off-screen performance at 1080p resolution. The on-screen tests propel the HTC One M9 skywards since it has 1080p native screen resolution. As such it offers superior GPU performance compared to say, the Galaxy S6. As we said, the 1080p display is quite an advantage here as the graphics chip has fewer pixels to output. Finally, we ran the BaseMark X GPU test, where the One M9 outed a similar score to the G Flex2 (1080p, Adreno 430), the Note 4 (Quad-HD, Adreno 420), and the Nexus 6 (Quad-HD, Adreno 420). HTC One M9 is seriously fast, as expected. It is among the best devices when it comes to CPU, GPU, storage and overall system performance. Its web browsing performance is perhaps the only thing that spoils the great overall impression. As we already mentioned, the smartphone got pretty hot under use, but after the latest update, that takes a longer time. Truth be told, it didn't get unpleasantly hot, but it is winter around these parts and come summer, we suspect it may get worse. It seems these overheating problems will become the Snapdragon 810 undoing - Qualcomm already announced its successor, the Snapdragon 815, which reportedly, runs cooler than the Snapdragon 810. We wouldn't be surprised to see early 2015 flagships switch to using the newer chipset later in their life cycle.